This spear is an original specimen given to me as a gift by a grateful Bushmen tracker in the Kalahari-Ghansi district in Botswana where, after a real nail biting leopard follow-up, I’ve shot and killed the leopard mere milli-seconds before it could jump on the tracker. After seeing the pictures of my uncle hunting with his big cold steel boar spear, and not to be outdone, I’ve thus decided to also try my hand at hunting a warthog with my own spear. I've took refuge in an old feeding trough krip where the warthogs frequently came to drink water. Some good ones came in, but they were just too far away for an accurate throw. After a considerable time, just when I contemplated to leave, three young warthogs came in and start drinking about 10 m from where I sat concealed in waiting! My heart start racing and I could not believe my luck! On the spot I decided to take this opportunity, and after some planning and concentration of how to quickly stand up and my arm movement at the same time, I burst into action and let fly at the nearest warthog. rushed away into the bush. After the adrenalin rush and when I've calmed down some, I went to retrieved my spear. Like lightning they were off on the spoor and before long after about 50 m in the bush, they were in a huge fight with this by now very aggressive wounded young warthog boar many, many times their own size and weight! I waited for the right moment in the melee and dust, and then let fly with my spear again. When the spear blade hit the warthog behind the ear, it dropped like a stone. Well, it’s definitely not one of my biggest warthogs that I've hunted so far, but surely one of my most exciting warthog hunts up to date! 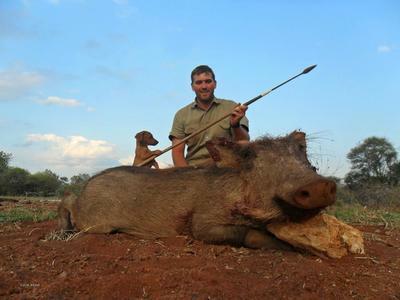 Now, this young warthog is going to make a very tasty meal roasted over the campfire!